The National Telecommunications Information Administration just published the findings from its latest survey about Internet use within US households. 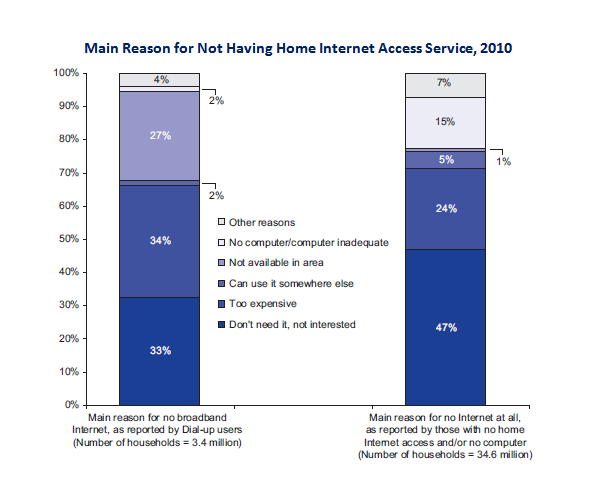 In case you missed it, here is a summary: broadband adoption among US households went up, but not by much. Actually, that is not entirely fair. Viewed at short intervals, broadband adoption will appear to be a slow moving process. However, a little stepping back from the short run headlines reveals good news and bad news in this report. That is the point of this post. Let’s start with the key picture. It updates government surveys on Internet use with data from October, 2010. This is the best survey on this topic in the country, and it has been collected longer than any other, so each new release deserves attention. The good news is obvious in the picture. More households use broadband than in the prior year. 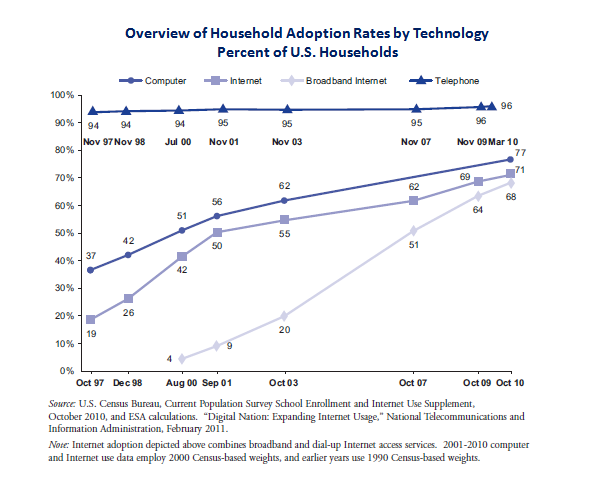 A whopping 68% of US households have broadband, while another 3% have dialup. Considering the commercial industry was just getting off the ground two decades ago, that is pretty darned impressive. The bad news is a bit more subtle, but also obvious in the diagram. Most of the growth in the last few years arose from a combination of new users and the replacement of dial-up with broadband. Why is that bad news? Look at the diagram. The latter trend has near finally finished, since there are almost no more dialup users left. 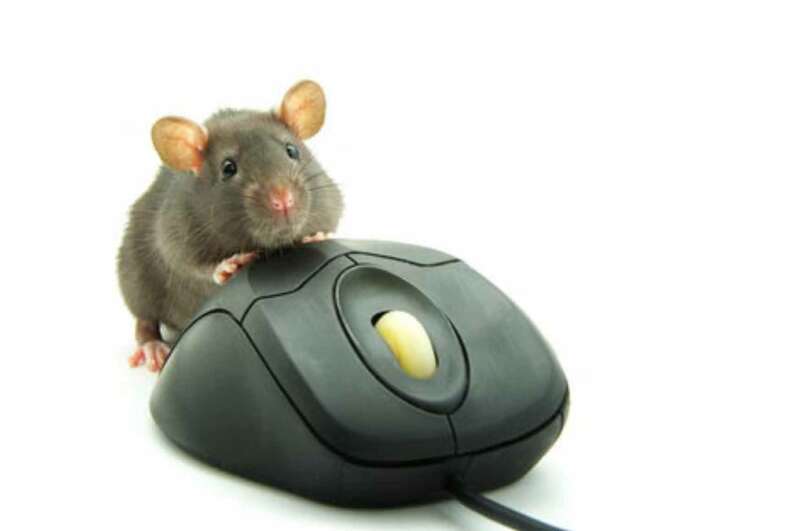 In October of 2007 11% of households still used dialup. That is down to 3% today. Even in the recent past a significant fraction of broadband adopters were simply converts from dialup. But the diagram tells the obvious story: most of the converts have, well, converted. That means virtually all future growth has to come from new users. Which gets us to the second picture. It shows the results of surveys of non-broadband users. It asks those users to explain why they do not have Internet access at home. Once again, there is good news and bad news in the diagram. The good news is in the left most bar chart, which surveys dialup users. The two biggest reasons for not using broadband are expense and availability. Both of those should get better over time, albeit slowly. There is still hope for more converts. The bad news is in the right bar charts, which covers the vast majority of non-users. The first and third biggest reasons for non-use are “don’t need it, not interested” and “No computer/computer inadequate.” Why is that bad news? Simply stated, this is the population that will fuel most of the future growth. Yet, neither of those reasons for not adopting will go away easily. Both issues defy resolution, either through good marketing campaigns from private providers, or with any reasonable policy intervention. Finally, the second most common reason for non-adoption — too expensive — will eventually be overcome, but it too is likely to be slowly overcome, as already noted. In short, new adopters will be hard to come by. To summarize, the diffusion of broadband continues, but it is reaching some limits. There are just not many dialup users left to convert to broadband. The next phase has to involve generating new users, but that is likely to be considerably more challenging to overcome, as it involves generating adoption from a population of households who have little reason to act.